There comes a time in every man’s life when summers become a seemingly endless succession of other people’s nuptials. If you haven’t reached that point yet, then rest assured: summer wedding season is coming. As is the constant deliberation over wedding attire. Sometimes, in the case of stricter dress codes, there’s a right answer. Sometimes there’s no one definitive right answer, but definitely a lot of wrong ones. And sometimes there’s a grey area the size of greater London that you have to navigate blindly. Don’t worry. If the invitation doesn’t tell you in as many words, then the other information therein – like location and time, of day and year – can give you a steer. As will this guide to what to wear for every summer wedding you have lined up. If there is any lawful impediment to the happy couple-to-be joining in holy matrimony, it won’t be your ungodly fashion crime. These aren’t just pretty little pieces of paper. A wedding invitation is the first clue when it comes to pulling together an on-point look for the occasion. Make sure you pore over the details and check to see if the soon-to-be-wed couple has specified a dress code. “The most important thing to bear in mind when attending a wedding is that you respect the dress code on the invitation,” says celebrity stylist Joe Ottaway. “I’d suggest erring on the smart side, too.” Mind this man’s words – his past credits include dressing the likes of David Gandy and Jude Law. No, not on TripAdvisor. Before deciding on what to wear to a wedding, it’s worth considering where it’s taking place. Just because a wedding’s dress code is strict, doesn’t mean you have to shed all personality. “Whether formal or informal, you need to ensure you’re suitably dressed but still remain true to your personal style,” says style expert Jo Harris, who has worked with the likes of Harrods and Burberry. Add a neatly folded printed pocket square or a contrast-sole brogue, subtle touches to customise your look with something personal and memorable. While ‘doing you’ is sure to win style points, it’s only polite to stop short of stealing the spotlight from the main man. “The most common rule for female wedding guests is to refrain from upstaging the bride – and the same applies to men,” says Farfetch menswear editor Tony Cook. That means no full morning dress for relatively informal weddings and definitely stowing away that neon pink suit for another soirée (or, perhaps more fittingly, a fancy-dress party). Choosing the right suit fabric is one of the most important considerations any time of the year, but it becomes particularly important for summer weddings when rising temperatures and sweat patches can conspire to undo your hard sartorial work. Breathable materials like linen, cotton and blends of the two serve well for weddings in hotter climes, while merino wool and cotton-wool blend styles are preferable if the marriage is taking place somewhere where summer heat is relatively moderate. Morning or formal day dress is the pre-6pm equivalent of white tie, and not something that you can mess with. The non-negotiables are: a black or grey morning coat with tails, a light-coloured waistcoat, a white or light-coloured shirt with a turn-down collar and double cuffs with cufflinks, a tie or cravat, grey or grey-and-black-striped trousers, and black shoes. A black or grey top hat is optional, outside of the royal enclosure at Ascot. A grey topper is, amusingly, considered ‘less formal’. “Ties are preferred,” says etiquette guide Debrett’s, with no explanation necessary but a quick Google search to see the alternative: cravat, matching pocket square and beige waistcoat horror shows. “I prefer a black herringbone morning coat with a dogtooth trouser, paired with a double-breasted pink waistcoat,” says Oliver Spencer, who when not designing his eponymous fashion label is the founder and creative director of Favourbrook occasionwear. Whatever you do, don’t put a foot wrong. “It’s key not to wear brogues: opt for Oxfords instead,” adds Spencer, who also insists on an off-white or sky-blue shirt. “Either way, the guiding principle is to not look like you came from work,” says Simon Holden, senior menswear designer at John Lewis. In the case of a three-piece, a waistcoat also helps you look vaguely put together when the jackets inevitably come off later in the evening, plus covers sweat. A reason to stick with a safer and smarter white shirt as opposed to perspiration-showing pastels. Silhouette-wise, double-breasted is another viable alternative to your everyday two-piece, as is switching up the fabric from ubiquitous wool to something snazzier like mohair or less stuffy like linen, depending on the desired vibe. And temperature. 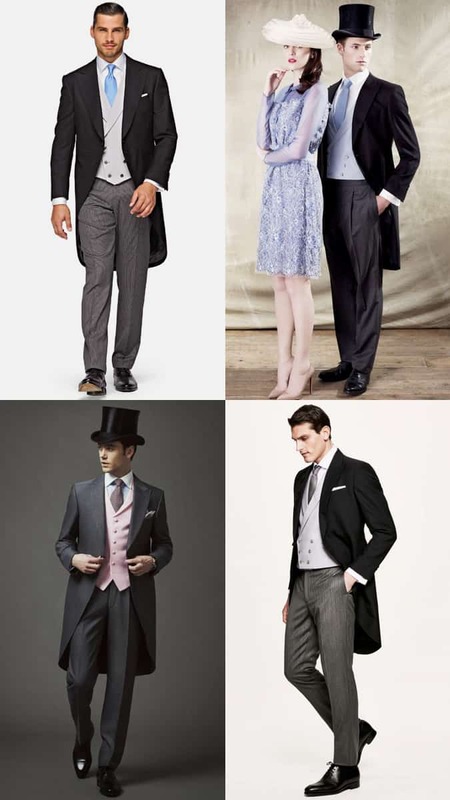 AKA dinner suits (or jackets), tuxedos or cravate noire, black tie is less formal than white tie, in the same way that a grey top hat is less formal than a black one. It’s still pretty damn formal. Your checklist: a dinner suit with contrast lapels in a fabric like grosgrain or silk and trousers with braiding down the leg (yes, even if the invitation just says ‘jackets’); a white dress shirt with turn-down collar (wing is for white tie), double cuffs and cufflinks, plus some kind of fancy front and often studs or concealed buttons; black shoes (Oxfords or other unadorned lace-ups). Oh, and a well-tied bow tie (not clip-on). “Avoid wearing black and opt for midnight blue, which is far more interesting,” says Spencer. It’s also historically correct, and looks blacker under artificial light. The point of black tie is to create a uniform effect among the menfolk, but you can still subtly distinguish yourself through texture such as velvet, adds Spencer. Or just peacock in a cream dinner jacket, but note that if you’re not the groom, his feathers will be ruffled. It’s possible to have a very formal rural wedding, of course. But generally speaking, you’re outside the city limits in more ways than one – and free to wear brown shoes with no fear of a dressing down. Maybe even brogues or Derbies rather than Oxfords. “For a country wedding, there’s more scope to wear separates rather than a full suit,” says Holden. “However, don’t break the boundaries too much. Adhere to a smart jacket and trousers with a shirt and tie. You can incorporate a waistcoat that matches your jacket or trousers for an added element.” Just remember the venue isn’t Toad Hall. You’ve also got leeway if not quite carte blanche to expand your palette beyond the conservative metropolitan standards of navy and grey. “In terms of colours, opt for warmer, more neutral tones with texture,” continues Holden. Mattified fabrics feel more casual and country-appropriate (and will stand up better to chunkier footwear), as do patterns like checks – not to mention florals. It’s contingent on the country in question, but odds are it hasn’t been selected because there’s a high chance of rain. And unless the dress code is Hawaiian shirts, shorts and flip-flops, you’ll need to balance the requisite degree of formality with the risk of heatstroke. “A linen suit is the perfect option for a hot wedding,” says Holden. That, in turn, conjures images of old-timey southern gentlemen. “A fitted jacket with tapered trousers in grey or blue will keep the look modern. You can also explore cotton suiting to keep you cool.” Don’t discount seersucker, especially in a block colour rather than Colonel Sanders stripes. An unlined jacket will allow air to circulate – and sweat to evaporate. Your cotton or linen shirt should have a softer collar to match your less structured tailoring. Accessories-wise, nothing overly silky or shiny that will reflect the sun – linen is a good choice for ties and pocket squares too. Finally, loafers are a halfway house between Oxfords and sandals. A wedding isn’t the place to flip-flop, in any sense. The ultimate all-rounder. For the vast majority of weddings, a slim-fitting two-piece suit will satisfy the requirements of the dress code, and it can also be worn several times over, provided you switch up your shirt and accessories. 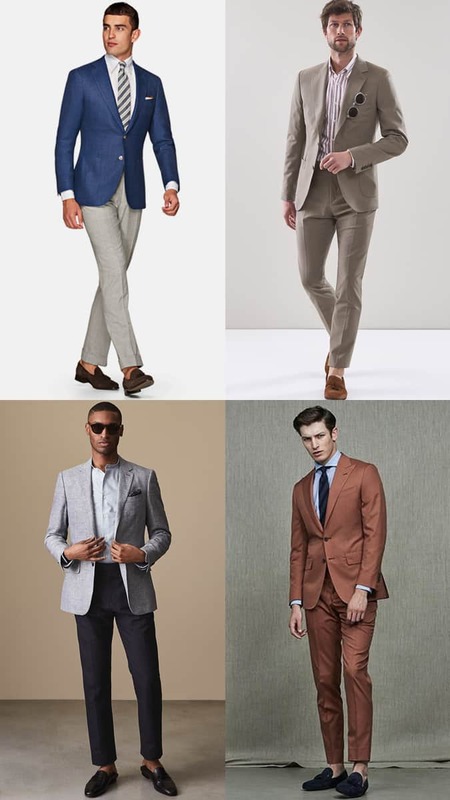 For a versatile suit that won’t date anytime soon, opt for a colour like grey, navy or a summery neutral such as beige or stone. For something that’s just as easy to wear but packs a punch, however, try a richer hue like cobalt or sage green. Whoever coined the famous superstition ‘bad things come in threes’ had clearly never discovered the subtle art of adding a waistcoat to a stylish suit jacket and trousers combination. 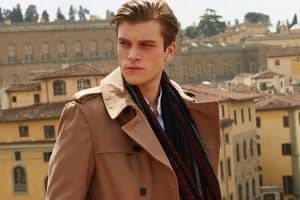 The sartorial triple threat – a move regularly favoured by the likes of David Beckham and Ryan Reynolds – is not only a smart choice for the everyday, but an easy way to up the style ante while the loving couple bangs on about ‘having and holding’ when all you want to do is have and hold a drink. Few summer weddings will require a dinner jacket, but if you’re attending one taking place in the evening rather than the afternoon, then this is a possibility. Presuming you’re not part of the wedding party, black tie means a DJ (no, not the type at the reception). 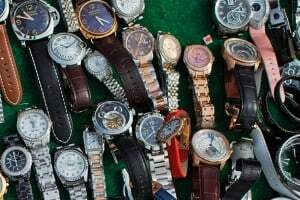 When making the call on whether to buy or hire, consider whether or not you currently have the means to secure yourself something of a decent standard – you’ll get good wear out of it over your lifetime, provided you don’t change in size dramatically. Done right (cut slim, but not too tight that the buttons pull), a modern double-breasted jacket is more baller than banker and can help a wearer stand out without having to resort to brightly coloured shirts or garish pocket squares. Perfect for narrow frames, the upward pointing peak lapels make your chest look wider while the overlapping fabric nips in at the waist to create a flattering hourglass shape. If you’re also on the shorter side, opt for four buttons rather than the traditional six or eight configurations to give the illusion of height. For less formal weddings (which is most nowadays), take advantage of a relaxed dress code by switching up your suiting. Again, the key consideration when weighing up potential purchases should be material. After choosing fabric, decide on colour: shades of blue and grey, from dark to light, and softer neutrals like beige, stone and ecru all mix and match well together, while pastel hues like mint, baby blue and pale yellow are solid on-trend options.